A World Intellectual Property Organization patent landscaping report launched this week shows that although a large number of patents have been granted on technologies aimed to help visually and hearing impaired persons, most of them have not been commercialised yet. On the side of the 30th session of the WIPO Standing Committee on Copyright and Related Rights (SCCR), WIPO launched the Patent Landscape Report [pdf] on Assistive Devices for Visually and Hearing Impaired Persons. Edmond White from Thomson Reuters said Reuters has an IP Analytics Unit which has been commissioned by WIPO to produce a landscape of patent activity concerning inventions intended to assist persons with hearing or vision impairment. The side event was one of a series concerning the implementation of the Marrakesh Treaty to Facilitate Access to Published Works for Persons Who Are Blind, Visually Impaired or Otherwise Print Disabled, adopted in 2012 and not yet into force. The patent landscape presented by White is broader than the Marrakesh Treaty as it also concerns people with hearing disabilities. Exceptions and limitations to copyright for people with other disabilities than visual impairment are on the agenda [pdf] of the SCCR this week. According to the report, some 9,000 inventions, and 35,000 patents have been awarded globally since 1980 on visual and hearing impairment. There are more patents than inventions because patents can be filed in several territories, White said. Historically, the growth in patents has been due to US innovation, but next year China is expected to be the largest source of patents in those fields, although most Chinese patents are filed domestically, not internationally, according to White. The commercialisation of patented technology is still however happening in developed country markets, he said. Patent technologies are focused in three major topics: hearing and vision restoration; hearing and vision enhancement; and hearing and vision assistance, he said. Those include speech and text technologies, ocular implants, electric stimulating devices, and hearing aids, he added. According to the report, innovations concerning access to published works seem to have been patented by individual inventors not associated with a corporation, White explained. The only major corporate applicant is IBM, he said. One of the conclusions of that trend is that visual and hearing impairment are not a commercial field yet, he said, as large companies are not investing in the area and this seems like a commercial barrier, he said. Patent activity from academic institutions is relatively high, he said, with 8 percent of all patents in the field, and a focus on vision enhancement and vision restoration. 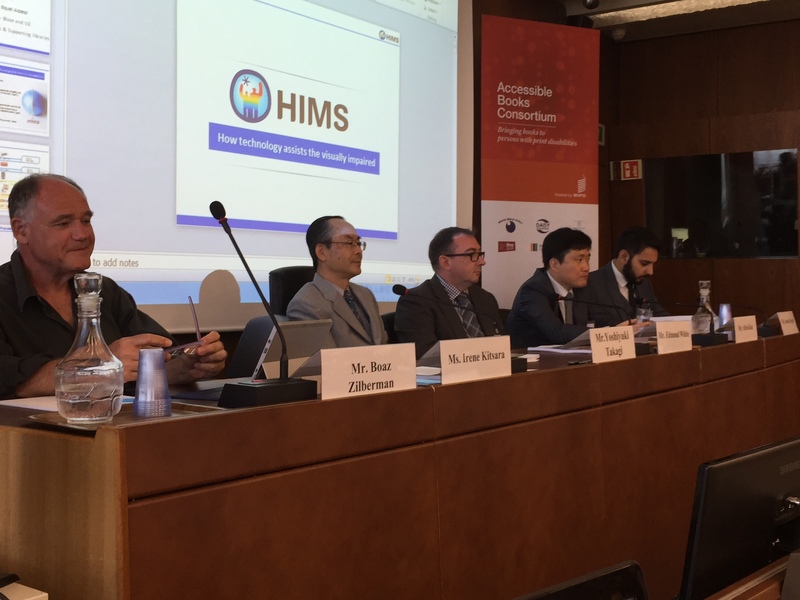 Alvin Kuk, director, sales & marketing team, HIMS International Corporation focused his talk on how HIMS technology assists the visually impaired. Kuk mentioned that HIMS was started by providing note takers for blind people. Since then, HIMS has evolved its portfolio and currently provides a variety of products for the visually impaired. These range from Braille Notetakers and Braille Displays to OCR Multiplayers. Kuk also identified certain challenges currently being faced in the industry including, lack of availability of electronic libraries, proprietary forms for protection, and the high cost of accessibility products for the consumers. Sumit Dagar, founder of Kriyate, discussed how Kriyate was created with the vision of developing a Braille Phone. It was supposed to be a tactile smartphone for visually impaired individuals which featured a tactile display screen where pixels could move up and down to form touchable patterns. After creating a number of design and technical prototypes, Kriyate decided to stop working on the Braille Phone. Dagar commented that currently there is not enough refined market research available in the visually impaired field to gain investor confidence. Boaz Zilberman, founder and CEO of Project-Ray, provided information on the project. Ray is a mobile device interface which is hosted on a regular Android phone for visually impaired individuals. Zilberman said that “80 percent of the blind are elderly people that lost their vision at the age of 60 and above.” Therefore, he commented, that most of these individuals are not able to read Braille and it is hard for them to learn at that age. Project Ray aims to target this market. Zilberman said the industry is in an early stage and digital solutions are around the corner. Rishi Dhir is an intern at Intellectual Property Watch. He holds a Juris Doctor with honours from the University of Ottawa, Faculty of Law. He also holds dual Bachelor Honour Degrees in Mathematics and Business Administration from the University of Waterloo and Wilfrid Laurier University. Rishi has an interest in a variety of IP issues including copyright law, piracy and Internet governance. Ani Mamikon is an intern at Intellectual Property Watch. She recently completed her Juris Doctor at the University of Ottawa, Faculty of Law. She holds a Master’s Degree in Political Science and International Security Studies. She has a strong interest various IP issues relating to privacy, human rights and information technology. Recently, she has also developed a keen interest in patent law. Ani Mamikon may be reached at info@ip-watch.ch. Rishi Dhir may be reached at info@ip-watch.ch. "Report: New Technologies For Visually And Hearing Impaired People Lack Commercialisation" by Intellectual Property Watch is licensed under a Creative Commons Attribution-NonCommercial-ShareAlike 4.0 International License.